I have a Malshi too called Pepe. She has a boy's name because she chose that and came when I called that name. She is very intelligent and easy to train. She needs to be groomed and her fur is so silky soft that it knotted easily, so now she been clipped back quite a lot and looks strange. I love my Malshi and she loves to play and fetch toys we throw for her. 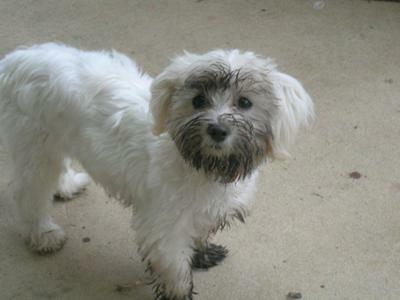 She did get into my small veggie garden and began digging so this pictue of her shows the guilty evidence! That's one thing about Malshi's, they are diggers!!! What a cutie pie!! Has a look...like "Who me?" lol Don't you love that puppy cut? But if Pepe is like Ollie...it grows way too fast! How old is Pepe and what does he weigh? Also wondering what food he eats. I just switched Ollie to Blue Buffalo and it's his favorite...especially when I warm it a little...which releases the smell and flavor (my sister heard that advice on Animal Planet). Tell Pepe HEY from Kentucky!! Belle is my grandson's dog, and I get to watch her when they are off on a vacation. She is a Malshi and is close to 3 years old. I took her to Starbucks last Sunday where I believe she enjoyed her first kiss from another dog. I think she is very smart and she follows me everywhere I go. She learns something once and remembers it forever. Our Malshi slides over the carpet digging her face into it with every bit of energy she has. I'm not sure if her ears are bothering her or her face just itches. Anyone knows? Sounds like it is an ear infection. You might want to take her to the vet just to make sure. We groom our Malchi ourselves and the first month we had her she ended up getting some water in her ear that led to an infection and the first sign was her rubbing her head on the ground like that. Otherwise if your puppy will let you get in her ears you can try to look at the color... should be nice and pink. It shouldn't smell bad (sounds weird but you can usually smell their ear infections) and you can also very gently rub a cuetip down in their ear and see if anything comes up on it. If any of these things happen it is probably an infection. Gypsy Rose is a 3 month old Malshi with bundles of energy for short periods of time and then drops for a nap up to an hour or more at a time. She is inquisitive, nosy, loves to chew on squeaky toys and play with our queen of the house, the 14 year old Golden Retriever, named Squeaks. Squeaks, as an adopted "mom", has basically house broke the pup in 2 weeks. Since Squeaks is loaded with "command/buzz" words, when someone says "outside", they actually race to the backdoor together and then the pup sits down and waits to be carried to her outside pen. Gypsy is too little at this time to give free run of the whole backyard. My Malshi is a mischief maker and also loves to tear up papers, like newspapers, phone books left on the floor accidentally, work papers laying next to the brief case. She hasn't learned how to climb on furniture yet, but with the aid of Squeaks as a ladder, she has managed to get into one chair and then was afraid to get down. She presently weighs 5 lbs and so far doesn't mind her vet too much. My Malshi Shy took almost a year to housebreak after I adopted her at 5 or 6 months. She still has frequent accidents because she hasn't learned to ask to be outside. I'm working on that. Yet she is very smart. Some things she learns almost instantly or teaches herself, like untangling herself from her leash or jumping into the car. I cannot teach her to sit no matter what I do. In the house, she barks at everything and nothing. She pulls mightily on the leash and I can't make her stop. Luckily, she is also very playful, loves other dogs and people, is affectionate, is funny and my other dog loves her. Her favorite thing is to run, second is to dig holes. 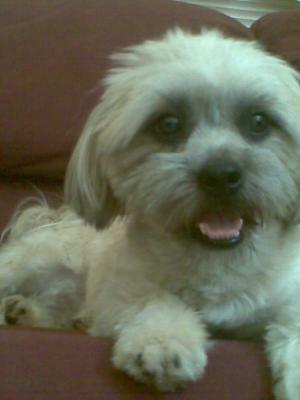 I've had 3 maltese dogs and am familiar with shih tzus. The only thing Shy has in common with either is her beautiful coat and her love of tearing up paper, as all my maltese did. 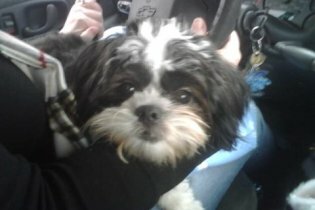 My daugther found our Malshi along the road, we tried to find his owners... nothing. So we adopted him. The vet says he is a Malshi. He also told us that he is a older dog. He has the best personality, he loves kids,people and other pets. He was housebroken when we got him. He loves to cuddle and never meets a stranger. Your Mal-shi is very cute, and it was so kind of you to rescue him! I'm sure he will be such a great companion for you. Bless you! 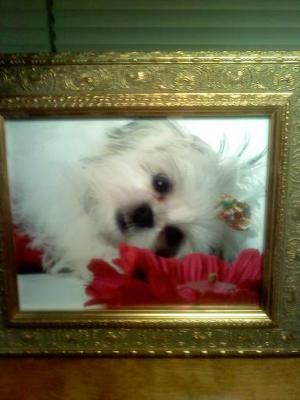 My Malshi turned 1 in January of 2011. He is the best investment I have ever made. 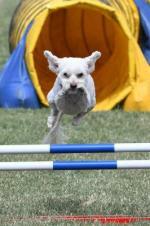 My Malshi is a VERY determined dog. He wants to do what he want to do, unless there's a treat involved. (He LOVES to eat-anything.) He is a sweet dog, very sociable. He loves his best friend who is a golden retriever, and he loves people. ( He is a male and is not fixed-despite this he has NO dog aggression.) He is incredibly intelligent, it usually takes him only a few repetitions before he has a trick down. I am a first time puppy owner and had no problem house breaking him. You can tell he's thinking. He thinks he's a big dog in a little dog's body. I would highly suggest the breed. I honestly can't even imagine not being with him. They are independent dogs. Oscar loves me and his father, but if we leave him at home he is happy playing with his toys. He is not destructive. (He use to chew chairs as a puppy but has since grown out of it.) HE IS NOT YAPPY. He only barks is he hears something. (I think he has some watch dog tendencies-but he's missing the intimidation factor.) 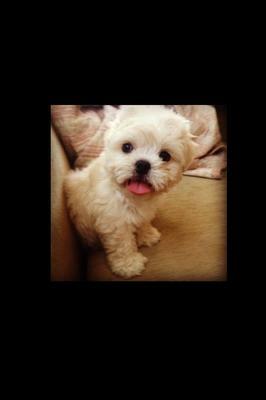 I think he is one of the cutest Malshi's I've seen. 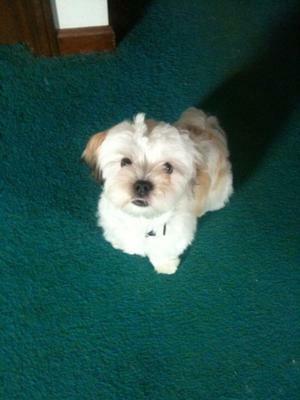 When he was a puppy he use to be tri-colored like a Shih Tzu, but has since become almost entirely white. No health issues so far, although he does have dry skin in the winter. Our male Malshi is 11 years old and everyone loves him and he loves everyone as well. He has a basket full of chewed up stuffed toys and he enjoys each and everyone one of them. He loves to play and has always been very social around all animals. We adopted him from our daughter and it was the best thing that we ever did. Yes, our Malshi is a lot of work to groom, but I do it and he is so patient. We never owned a dog that actually jumped in a tub to have a bath, followed by extensive grooming. Of course, this may be because he is well rewarded each time with special treats for his good behaviour. My husband and I will be crushed when it comes time that our Jack will have to leave this earth. Our Malshi is so very special. 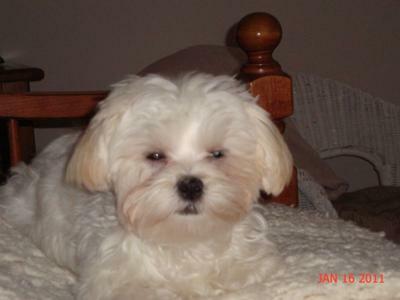 Leila is a sweet, loving little Malshi born February 2nd, 2008. Her greatest attribute has to be her watchdog quality. She strives to take very good care of her family by alerting us to any "potential threats" on the house. She is very devoted and protective of us. 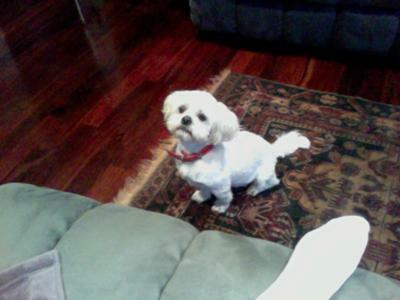 My Shitzu Maltese was extremely easy to housetrain having very few accidents in the beginning. She loves going for her daily walk and usually takes a short nap afterwards and is ready to play upon awakening. The only negative thing about her temperament is that she does not get along with other dogs and will bark furiously if she encounters one. Although my Maltese Shitzu does ok in a dog park, but has a hard time socializing with other dogs. Nevertheless, we love her very much and she has brought endless sunshine into our lives! My Malshi is the most wonderful little dog I've ever had. I love him so much, I swear he's human! 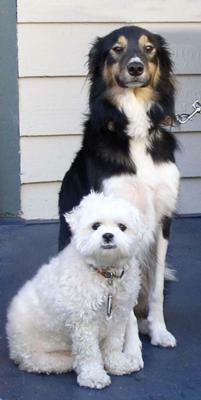 I will never own another breed, Malshi dogs are fantastic. I can't say enough positive things about him. He's funny, smart and was extremely easy to potty train. Our Malshi dog Molly is very affectionate. She takes every step I do and does not want to be without me. She does tend to have seperation anxiety, even if the time I leave her is for only a couple of hours. She is the most loving dog we have ever had. She plays well with other dogs and loves when we have company over. She loves to be in my lap, but will also get down to play and entertain herself. 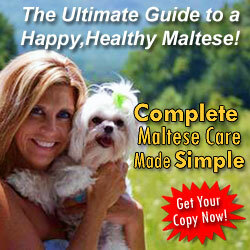 I highly recommend a Malshi if love and extreme affection is high on your priority list! I would not even consider another breed after having her. She is smart, and a little stubborn. Puppy Kindergarten helped tremendously with the stubborness. From my experience a Malshi never disappoints! Mutley is a male Malshi, He turns 2 on the 3rd Of August 2010. Mutley isn't very big, but he has a very big personality. He loves everyone and isn't afraid of going and saying hi to them no matter what they seem like. Mutley is a very smart dog too. He never leaves your side if you take him out, you can trust him not to kill the turtles or cats unlike our other dog Bindi, 3 Malshi also. Mutley plays Hide and Seek with my little sister Bethany, He keeps the game going forever, but he always wins, must be good having such a great sense of smell. Mutley is a inside dog and only goes outside when we make him. He sleeps inside and won't get of the end of your bed all night, probably cause he's comfy or the fact that he cant jump back up. Mutley has a very unique face he has a back beard around his mouth and his bottom teeth stick out a little bit (over-bite), its very cute. He is a brown & black Malshi with a little bit of white. There is so much more about Mutley but you can't describe him anymore, you just have to know him! Our family is so grateful to have such a lovely, amusing, fun, good-natured dog! We have just rescued a 6 year old Malshi. She is quite large in comparison to my mother's two but also is less prone to barking - in fact we have only heard her bark once in 6 weeks. She has already become very much part of our small family. I have noticed that our dog and some other Malshis have a cross bite or an extra couple of teeth in a row just behind their front teeth. Is this usual and why? She loves to sleep on my son's bed every night and since living with us her excessively itchy skin has reduced. Definitely adore our Malshi Pebbles!!! Two Paws UP! for Pebbles the rescue! Hi Pebbles! We are two Maltese dogs LuLu and LoLLy! We are so excited to hear you found good humans to rescue! WE love rescue! LoLLy is a rescue and she is AWESUM! WE love rescue so much, we created the worlds first dog music video called, "Rescue Dog Rock". Check it out at http://www.luluandloly.com. While you are there you should sign our health care Pet-tition! We are hoping to get other dogs adopted! Your Maltese paLs, LuLu and LoLLy! I have a Malshi named Bella. She is 3 and a half, I had her since she was a puppy. She is one crazy little girl, very playful and so damn smart... too smart lol. If I'm having a bad day she knows and she always comes to comfort me. 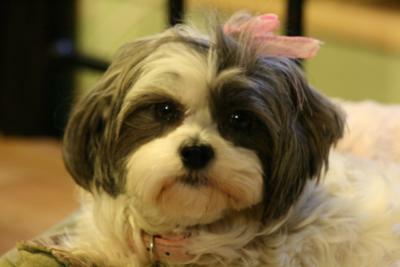 My Malshi is so funny to watch when she plays with my other dog a Shih Tzu Yorkie mix. They are amazing dogs and I wouldn't trade them for all the money in the world. Rosie is my lovely Malshi. She is almost seven years old (birthday: 10th October). She is white and has the cutest brown eyes. The facial expressions from this dog are hilarious! Despite her habit to stare at us when we eat and the fact that we need to trim her fur every three months or so, I can't imagine my life without my Malshi. 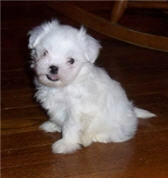 Our tiny Malshi Bella came into our lives at 4 1/2 weeks old and we were totally hooked! She is 6 weeks old now and we are working at the potty training diligently. She loves her toys and to snuggle in your neck. We love her so much already and will post pictures as she grows! 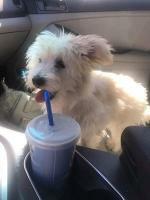 Zeus: my adorable Mal-shi is BEYOND playful and a ball of energy to be around! He is also very calm and loyal like a Shih Tzu. He follows me everywhere around the house even when I'm taking a shower he will sit on the bathroom rug waiting for me to get out haha. He LOVES to eat he's such a chubby puppy! He will lick his food bowls clean after every meal & loves chicken jerky as treats. He recently started obedient school. He is now (almost 6 months) & he's the best in his class he learns so quickly!! Haha or maybe he will do just anything for a treat ;) He has to go to the groomers every month because his hair grows too fast! When Zeus was 2 months he had cherry eye which is common in this breed he had it for one day luckily I massaged it and it disappeared like magic! He is a handful at times but his sweetness and cuddliness makes up for it! 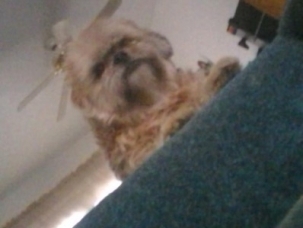 My daughter absolutley love you mal-shih-zeus dog! 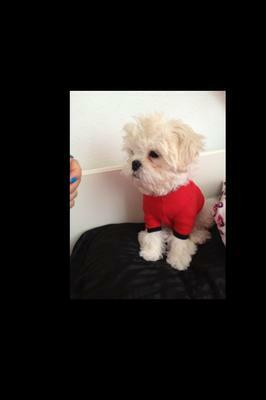 Wally is a three year old Malshi, although he is solid white like a Maltese. But he has the distinctive under-bite of a Shih Tzu. Oddly, he has a little stump of a tail which doesn't seem to belong to either breed? In any event, I've owned a Chihuahua, a Westie and a Scottie and hands-down, Wally is the friendliest dog I've owned, or even known. He will jump in the lap of the cable man, follow the meter reader around, and play with anyone (human or dog). He sleeps snuggled up to me on the bed or sofa, although he has also felt comfortable in a guitar case or laundry hamper. He must even wait next to me while I attend to business in the bathroom. He often goes to rehearsals in the theater where I work and he must meet and greet each individual cast member or he won't sit still. If I'm out, he sits on the back of the sofa and looks out the window, waiting for me. 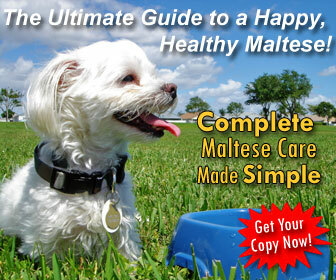 I recommend a Malshi whole-heartedly. Most malshis don't seem to have one so, in my opinion, you got lucky. We have a 2 year old Malshi that is our hero. On 2/17/11 we lost our home in a fire but thanks to Manny we did not lose our lives. The fire was within the walls without any interior smoke. For several hours Manny was very restless, barking, whining and refusing to let us sleep. Finally, at 4 a.m. my husband got up to see if something was outside and keeping Manny on full alert. It turned out that the roof was on fire. There was still no smoke or anything to alert us that our home was burning. Manny spent several hours trying to let us know we were in danger. His persistence and courage saved us. Twenty minutes after we left the home, the roof collapsed on the bed my husband was sleeping in. We love this little guy!! Today I am going to get him a brother to reward him for his courage. I am getting another Mal-Shi, of course. We always felt guilty leaving him alone. As you know, they are very sensitive. He is the most wonderful addition to our family and I am hoping that our puppy will fill our family with even more joy. He is definately your hero! Dogs are amazing... Proves you don't have to be Lassie to save someone. I'm sorry about your home, but glad you have your family. God bless.